This escape room was very well designed. I like the story and the tasks were just on the edge of pushing your comfort zone. There are two experiences (Chapter 1: The Basement and Chapter 2: The Boiler Room) with a third one on its way. My group and I chose to skip chapter 1, which is up to 12 people per group, and go for the more cozy and personal Boiler Room chapter 2. The puzzles were just challenging enough to make it hard to escape but not to a point where it was impossible to escape. My friends and I made it to the final task and ran out of time unfortunately. The staff was extremely nice and you can tell that they love what they are doing. I can't wait to go back and try Chapter 1 and the upcoming Chapter 3. Hopefully those times I will walk away with a souvenir that says I escaped rather than I was captured. In this scenario, you have managed to escape The Basement only to find yourself now trapped in Edward Tandy’s Boiler Room. 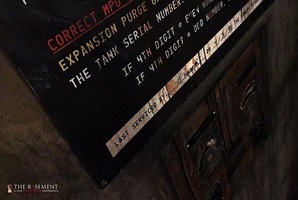 In the very same house where he captured, caged and consumed thousands of helpless souls, he has modified his Boiler Room to compact and dispose of the remnants of his victims. This experience is heart pounding, adrenaline pumping, and claustrophobically driven. You are in a much tighter space and you’ll have even less time to escape before Edward discovers that you have let yourself loose in his sanctuary. Inside you have accidentally triggered the room's automatic disposal function. Will you escape before you are crushed alive? 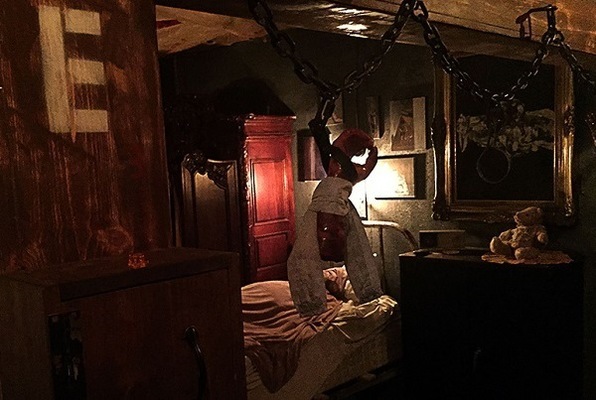 Reviews of escape game "The Boiler Room"
This is one of the best horror themed escape game hands down. I've done over 30 escape games in the Los Angeles and surrounding areas and this is one of my all time favorites. It is definitely the best horror themed escape game I've experienced. The boiler room is fun too. For Horror fans or escape room fans, this will be the most exhilarating experience around. Top notch Hollywood sets with atmosphere galore. The rooms are very challenging (and I have done many) to escape, there's a great story to it, and the best intro-mood-establishers before you start. A must experience. Did this for my brothers birthday with a group of 8, had a blast! We couldn't stop talking about it for hours after. This room is horror-themed, but nothing to scary. We made it out with 1 second to spare!! Very fun experience! Definitely will be going back for the other 2 rooms! Team building and bonding experience. The staff are very friendly, and really set the scene well. This escape room is a must! My friends and I did the Boiler Room on Friday and we loved it! It was our first escape room experience. It was a group of 4 and yes the room is really small like the others say. All the clues and things you need to solve are in the room and it is done in a linear function. If you are claustrophobic I wold not recommend doing the Boiler Room. Although we did not make it out we had a great time, got a good rush and really worked together hard to solve the clues. Will be going back to hopefully make it out all the way through. I went with three buddies into the Boiler Room. Claustrophobic. We failed and we were close to completion, but we had a blast. We enthusiastically told our wives about it and, a few weeks later, we went back together. Our wives did the Boiler Room and we we're going to follow and, hopefully, complete the room. We were sitting outside and heard screaming - our wives had finished the Boiler Room with about ten minutes to scared. Like the good men we are, we were pissed. But, in truth, they were so happy. We went back to the Boiler Room and completed it but it was more of a hollow victory because our wives were still rubbing our faces in it. Last night, about two months later, we took our wives, and two other couples to the Basement. Twelve of us (plus one?) running around gathering clues. It looked like we weren't going to make it. Then it all came together and we escaped with 00:00:17 left on the clock. It was EXHILIRATING! I mean there's no prize, you don't really win anything yet it's a very satisfying experience. Staff was terrific on all three visits. I think that makes a difference.